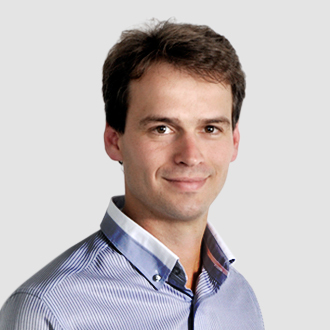 This entry was posted in General on 18.4.2019 by Jan Pešl. To learn the DPA usage, development set DS-DPA-02 can be used. All SW, plug-ins, documentation etc. are available on the flash disk and on www.iqrf.org/support/download. Prepare TR-72DATs with OS 4.03D as follows: 5 pcs as the Nodes and 1 pc as the Coordinator. Prepare 4 (5) pieces of DK-EVAL-04A and 1 (2) piece(s) of CK-USB-04A. Install the latest IQRF IDE. Launch IQRF IDE and open Project DPA-demo.iqrfprj from IQRF Startup package. All necessary files and macros are included in the Project. A. Plug a TR transceiver in CK-USB-04A, select the DPA-Node-STD-7xD*.iqrf file in Project window and click the Upload Plug-ins button on the Toolbar (or use the F5 key). The plug-in should be uploaded then. B. Double-click on the configuration file DPA-config.xml in IDE Project window to open the TR Configuration window. Select the desired RF channel (RF Channel A) in the OS tab. Nodes will inherit the value from the Coordinator during bonding. Select the desired RX filter in the DPA tab. For short range testing (within the room) select 15. For operating in real conditions select 5. Select the desired Access Password in the Security tab. See IQRF OS User’s guide, chapter Access encryption. This setting must be the same in the entire network! Do not change other parameters for now. Save the configuration into the TR by button Upload. C. Plug this TR into the DK-EVAL-04A kit. Repeat steps A to C for all Nodes. Use the same procedure but with the DPA-Coordinator-SPI-7xD.iqrf and DPA-config.xml files. Then leave the TR plugged in CK-USB-04A. application (in the real environment). The command currently selected in the DPA Test – Data to Send window can be executed by the right mouse button click on the symbol of given Node in the map and by selecting the Send Packet from DPA Test item. NADR is set automatically according to the selected Node. Click on the particular macro and PNUM, PCMD, HWPID and PDATA are automatically filled in. Then select Node Address in the NADR box (for Broadcast use address 0xFF) and click the Send button. Go to the LED macros and click on macro Set LEDR on. To switch all LEDs on, fill in 0xFF in NADR and click Send button. Use various macros and Node addresses to test the functionality. To get a better understanding of the DPA packet structure, you can also fill in the DPA packet manually. By clicking the right mouse button to the area for selecting NADR, PNUM, PCMD or HWPID, menu Predefined Addresses, Predefined Peripherals, Predefined Commands or Predefined HWPIDs is displayed. These lists allow to select items defined by the DPA specification and directly arrange the packet. From menu Predefined Addresses select Broadcast or directly specify the address of given Node. From menu Predefined Peripherals select the LEDR peripheral. From menu Predefined Commands select the Set on command. From menu Predefined HWP select the To All HWP item. Test other peripherals and commands in the same way. This entry was posted in General on 28.2.2019 by Jan Pešl. IQRF IDE Help for details. Programming – a creation of a user-specific IQRF application program. Editing – creation/modification of source code in C language. Compilation – compiling the source program from C language to .HEX machine code. Wireless upload (RFPGM) is also possible – see IQRF OS User’s guide, Appendix RFPGM and IQRF OS Reference guide, function RFPGM. Debug – allows to stop program execution and watch internal variables (break, watch and continue). Terminal – utility to control serial communication. Packet inspector decoding and interpreting packets logged in Terminal Log window. This entry was posted in General on 25.2.2019 by Jan Pešl. Integrated development environment by IQRF Tech to create, debug and control IQRF applications and manage the IQRF network. Required minimal IQRF IDE version depends on IQRF OS version of given TR transceiver and possibly also on the DPA version. See IQRF IDE Release notes. The best way is to always use the latest IDE version. USB drivers implemented in current IQRF devices (e.g. CK-USB-04A or GW-USB-06 with up-to-date firmware) are by the verified publisher based on the WinUSB by Microsoft. C compiler for the PIC microcontrollers (by B Knudsen Data). The evaluation version (included in the IQRF Startup package) is free. The compiler is not necessary when using DPA plug-ins without Custom DPA Handler creation or modification. For source code creation and modification, any external editor being able to save a plain ASCII text, e.g. Windows Notepad can be used. Notepad++ (a great source code editor, free by GPL License) is very recommended. Download it from www.notepad-plus-plus.org. This entry was posted in General on 21.2.2019 by Jan Pešl. There are also video tutorials available on IQRF Youtube channel. RF transceivers TR-72DA fits into SIM connector. They are fully programmable under IQRF OS operating system and allow to utilize the DPA approach for applications without programming. What is a Programmer? To upload application codes into TRs and configure TR parameters, the CK-USB-04A kit is intended. What is an evaluation kit? TRs (with application functionality codes uploaded using the programmer in advance) should be hosted in portable DK-EVAL-04A kits. Why you need a USB device? TRs can also be hosted by CK-USB-04A connected to PC via USB. It enables to control the TR application from PC, first of all by the IQRF IDE powerful tools for communication, testing, network management and visualization. This is advantageous, especially for the network Coordinator. ● Unpack two TR transceivers from the development set. Do not make any changes in SW inside. indicated by a green LED flash. is indicated by a green LED flash. ● You can move the kits and check RF link with respect to the given environment. Note: This link works plug-and-play thanks to the E09-LINK program which is uploaded in all TR transceivers in development sets delivered from the factory. It is one of the Basic examples from the Startup package and can be uploaded whenever needed later on. The arrangement with two DK-EVAL-04A kits see above. See Basic examples E01-TX, E02-RX, … in IQRF Startup Package. The only way to implement an IQMESH network is the DPA approach. For a quick startup, it is recommended to apply the ready-to-use DPA plug-ins without Custom DPA Handlers. Higher level, running under DPA and utilizing DPA plug-ins, which are ready-to-use SW plug-ins enabling communication in Mesh networks with no need for programming. TR is not controlled by an application program but from the control system via SPI or UART by the DPA protocol. All resources of the addressed device are accessed via sending requests and receiving responses. Requested functionality is achieved without programming. However, even this approach allows user-specific adapting by optional Custom DPA Handler programmable in C language. The DPA framework solves networking transparently. Just the addressees must be specified and then the packets are delivered automatically. This, together with the approach with no programming needed makes TRs very easy to implement. The entire network traffic is based on simple commands only specifying where and what to perform. Lower level, running directly under IQRF OS. The functionality is given by the application program in C language. This entry was posted in General on 18.2.2019 by Jan Pešl. Patented method how to send a command from the Coordinator to all or selected Nodes and receive answer (including data collected by individual Nodes) in outstandingly short time. This entry was posted in General on 8.2.2019 by Jan Pešl. Smart Home is UK’s ultimate event for the evolution of automated home tech for modern day & independent living. The event will have 150 seminars by the sector’s leading visionaries, 200 world-class suppliers and interactive features. Smart Home is really the “home” of the innovations changing the face of modern day living, taking place on the 26th & 27th March 2019 at Birmingham’s NEC. To register for your FREE ticket and catch Šimon Chudoba’s seminar visit www.smarthometechlive.co.uk. This entry was posted in General on 2.11.2018 by Jan Pešl. Regarding the release of the new OS, the IQRF Tech offers a significant discount on basic development tools – 50%! This entry was posted in General on 1.11.2018 by Jan Pešl. 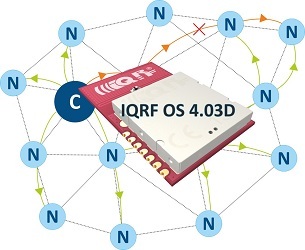 The new IQRF OS 4.03D brings many improvements to help you work with the IQRF®. These include, in particular, Smart Connect and Autonetwork V2. This is a new method of adding the Node to the IQRF network. The node does not need to be within the range of the Coordinator but must be within the range of the Node that is already bonded to the network. No action is required on the bonded Node side (for example, pressing a button). The bonded Node needs to have neither a working channel nor an Access Password of that network set in its configuration. Smart Connect is based on system communication encrypted with IBK (Individual Bonding Key). This is the unique and permanent code stored in each TR module during production. For the Coordinator to add the Node to the network, it must know its IBK and MID(Module ID). Smart Connect is implemented in DPA as the new Coordinator periphery command. HWP of a Node supports pushbutton bonding as well as Smart Connect. In the unbonded state (the red LED flashes on the Node), the Node is in LP reception (low power consumption) and expects the system’s Smart Connect packet. If the button is pressed, Node sends the bonding/pre-bonding requests. If the button is not pressed, the Node will go to sleep after about 5 hours. This long period offers time-space for installing Nodes and running the Smart Connect process. This time change is possible in Custom DPA Handler (event BondingButton). Alternatively, sleeping can be entirely disabled by using the Stay awake when not bonded configuration parameter. You can start the Smart Connect process by the Smart Connect DPA command sent to the coordinator on the Coordinator periphery. The key input parameters are the IBKand MID of the bonded Node, and the required logical address. Both IBK and MID can be detected by application or in IQRF IDE – TR Module Information (Ctrl + M). 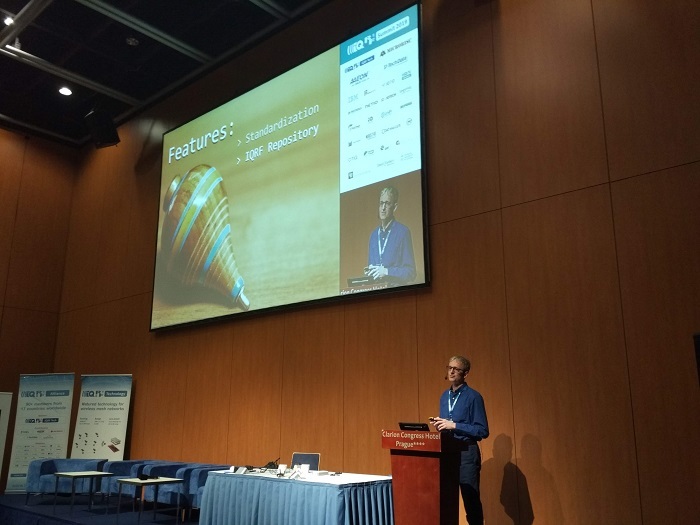 Smart Connect command can be tested, like any DPA command, in IQRF IDE via a terminal or more user-friendly via IQMESH Network Manager. The input parameters (IBK, MID) can be passed to the Smart Connect process using the so-called IQRF Smart Connect Code. This is an alphanumeric string where the IBK, MID, and HWPID (Hardware Profile ID) of the device are encoded. This code can be generated using the IQRF Code Tool in the IQRF IDE or by a custom application based on available documentation and can be passed in various ways, e.g. using NFC, QR code, etc. The IQRF Code Tool also can also be used to generate QR code. In IQRF IDE, a QR code for each TR module (Node) is created and stuck to the device containing this TR module. You place the device in the final place and read its QR code by a mobile application(such as IQRF Network Manager for Android). The mobile application is linked to the IQRF Repository and therefore it can find and display information about the device (type, manufacturer, drivers …) accordingly to HWPID. The mobile app will connect via API to the gateway based on the IQRF Gateway Daemon and launches Smart Connect. What about the working channel? From IQRF OS version 4.03D, all types of bonding (Local – e.g. with button, Smart Connect, Autonetwork V2) are running on service channels. Therefore, the bonded Node does not need to have the same working channel pre-configured as the network Coordinator. When installing a network, it is enough to set up a suitable (undisturbed) channel in the Coordinator, and all bonded Nodes will “inherit” this channel and store it automatically in the configuration during the bonding process. The exception is Remote Bonding – a “pre-bonding” part. Existing Nodes provide pre-bonding in the network, the process takes place in the background, on the working channel of the network, and the Node which should be pre-bonded must have this working channel preconfigured in the configuration. A user does not need to know the service channel numbers, they are listed in the IQRF OS User’s Guide – a channels map. In the case of Smart Connect bonding, the Access Password of the bonded Node does not need to be the same as of Coordinator. The IBK of the Node is used for encryption and authorization. Other bonding methods (Local – e.g. with a button, Remote, Autonetwork V2) require using the same Access Password. Access Password is still used for authorization in DPA Service Mode (DSM) and to encrypt/decrypt network backups during the Backup/Restore process for smooth Coordinator/Node replacement in the network (if needed). This is a new version of an automatic network creation using services deployed directly in the operating system. No Custom DPA Handler is required in the Node. Nodes do not need to have the same working channel as the Coordinator. The channel is “inherited” and automatically saved to the configuration during the Autonetwork process. The nodes to be added to the network must have the same Access Password as the Coordinator. Discovery (detection of a network topology). 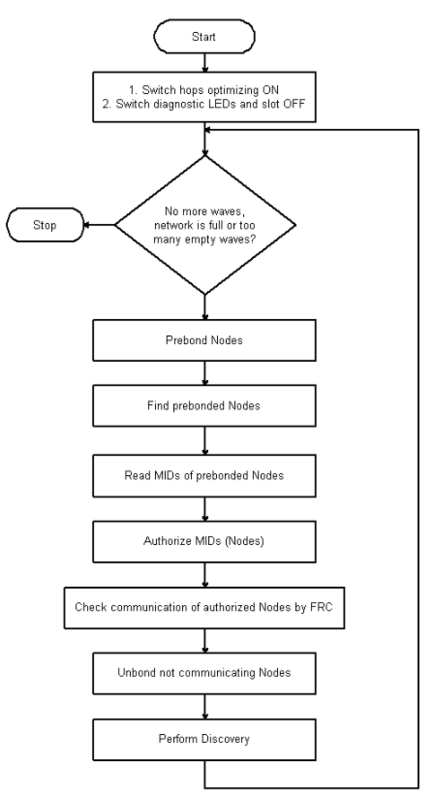 In the first wave, Nodes in the direct RF reach of the Coordinator are added to the network. In the next waves, also existing Nodes in the network are involved in the network creation. If no new Node is added during the set number of waves (default value is 2), the Autonetwork process is terminated. You can start the Autonetwork process with a DPA command sent to the Coordinator, the command is available, for example, in macros (name – Autonetwork embedded – Start). Are you interested in the IQRF technology and would you like to test it or buy some devices? Visit the IQRF Alliance website at www.iqrfalliance.org where you can find case studies from various companies that used the IQRF wireless technology in their projects or devices and services on a Marketplace with all its technical details. 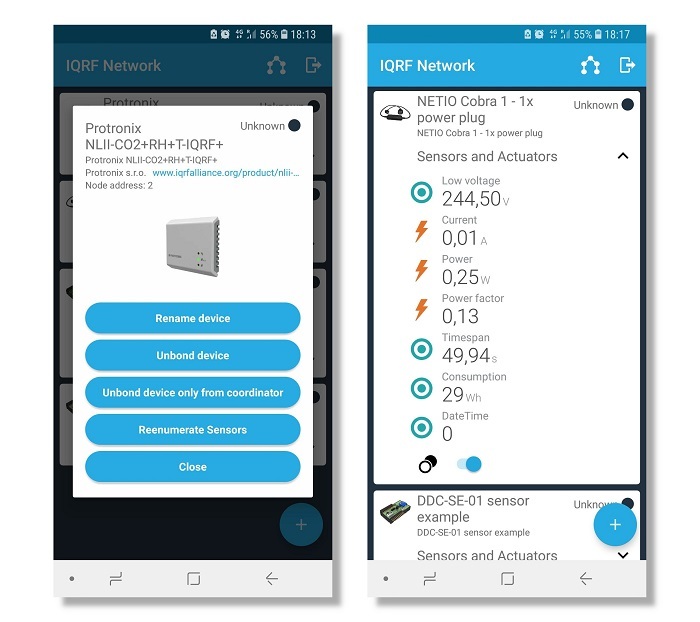 The IQRF Alliance is an international community of companies, schools and innovation centers that are using the IQRF wireless technology in their IoT projects, smart building, and smart city areas. The main goal of the IQRF Alliance is to help its members with promotion and sales leading to increasing the market share. Because together we are stronger! You can also visit the IQRF Shop at iqrf.shop where you can buy many IQRF devices from various manufacturers in one place. There are also discounts up to 70 EUR for IQRF Alliance members. Also follow us on social networks – Facebook, Twitter and LinkedIn. This entry was posted in General on 24.10.2018 by Jan Pešl.